Are you curious about how Patton’s Ethernet extender works for real customers? Let’s take a look at a case study from a Canada-based energy delivery company who was searching for a solution to help them capture time-lapsed photography of construction site projects located in the far north. The construction sites are located in the harsh climate with temperatures in the sun ranging from -40 Celsius or lower up to +40 Celsius during certain seasons. The temperatures often vary by as much as 30 degrees or more during short time spans. Also, the project sites include numerous fixed and portable buildings in a large area. 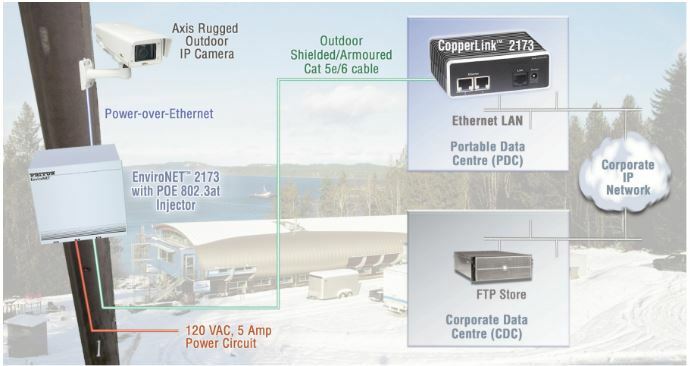 The portable data centers (PDCs) that provide communication services to site construction teams can’t always be set up in the ideal locations, therefore, the distance between an IP camera and the PDCs usually exceeds 100-meter standard distance limitation for an Ethernet segment. Indoor Extender—Patton CopperLink 2173 extends 10/100Base-TX Ethernet up to 245 meters (800 feet) at 50 Mbps. *Note: The CL2173 has been replaced by CL1212. Are you using Patton’s Ethernet extenders? How does it solve your project challenges? Use the comment below to share with us!